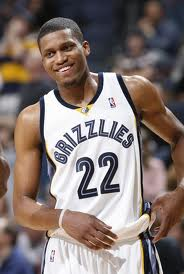 Yahoo sports Adrian Wojnarowski is reporting a deal is nearing completion to bring Rudy Gay to the Raptors from the Memphis Grizzlies. The deal being proposed to the teams respective ownerships Wednesday would see Gay coming north to the Raptors, while guard Jose Calderon and forward Ed Davis would be sent to the Grizzlies. It’s not yet clear if Calderon would remain in Tennessee or be part of another deal with a third team. Memphis ownership has been reported as attempting to move Gay and his 37 million dollar owing contract for some time. In the midst of a prolonged playoff drought there is fear of a trade being made just to make the team different, not necessarily better. Gay represents a not so unfamiliar element to the Raptors, a very talented player yet to reach their potential. Untill the deal is finalized we will refrain from any commentary on the merits of such a trade, but be careful what you wish for Raptors fans.